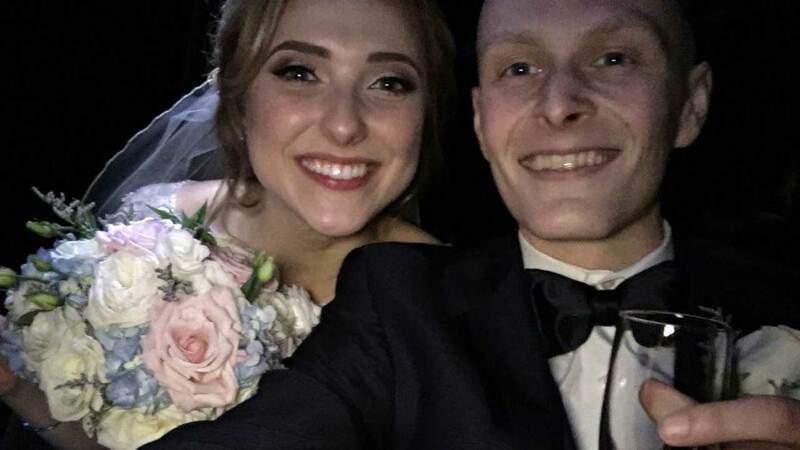 A Pennsylvania teenager with terminal cancer married his girlfriend on Friday, in a ceremony put on by the whole community. Luke Blanock posted a photo with his wife, Natalie Britvich on Twitter immediately after the ceremony. Almost everything needed for the teenagers' wedding was donated by members of the Canonsburg, Pennsylvania community. Walking down the aisle is a huge milestone for Blanock, who at times couldn't stand during his cancer battle. The former high school basketball star was diagnosed with Ewing's Sarcoma, a rare bone cancer in December of 2013, a Go Fund Me page created by his parents said. According to the page, his cancer has spread and is terminal. Blanock grandmother helped set up for the wedding and told WPXI how the basketball star suddenly lost feeling in his legs two years ago. "You go from being an outstanding athlete to not being able to walk out of the blue, no indication, just blindsided," Nikas said. Nikas said Luke proposed to Natalie a month after doctors told him the cancer spread and was now terminal. "He said, 'I'm not marrying Natalie to make her a widow. I'm marrying Natalie to spend 50 years with her.' And that's great. That's how it should be," Nikas said. Once members of the community heard about Luke's proposal, they donated everything necessary for the wedding since his family is still paying medical expenses linked to his treatment. Ashley Cyprowski, the wedding planner, told ABC News how thankful she was to the community who really came together to put on this wedding. "We got a ton of donations. The flowers, the reception hall itself, just a lot of people came together from our local community and donated their time, their services, and their goods," Cyprowski said. There were about 200 guests who came to celebrate and you can see more photos from the wedding here.